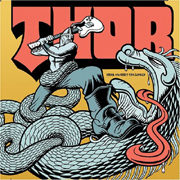 Thor (not the Marvel comic book superhero) has returned with THOR AGAINST THE WORLD, an 11-track rock record that sounds like those disposable albums done by Hollywood stars that get convinced that they can be rock stars on top of being crappy actors. You know the type, when they hire session guys and the music sounds great, but ultimately there?s something missing. Even though Thor has been releasing albums for over 20 years, has countless bodybuilding titles under his belt, and practically laid the groundwork for bands like Gwar, nothing can hide the fact that this disc, despite the fine musicianship and stellar production work, just doesn?t click. A guy with a name and a rep like Thor playing stuff that you'd hear from The Black Crowes? You do the math.